Friday, friday, got glittah on Friday. I cheat though. Sometimes I use...A Rhyming Dictionary! 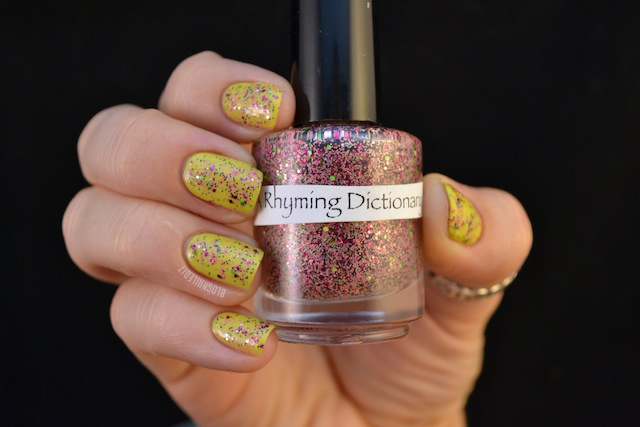 Check out A Rhyming Dictionary and the sparkling spectrum of glitter polishes below. "...What is she talking about?" I got an assortment of glitter and flakie-filled polishes. The store owner, Morgan, asked me if there were favorite polishes from her Wizard of Oz-inspired collection that I wanted to try. I chose a lot of itty-bitty matte glitters, but also told Morgan it's entirely up to her what she send. I wasn't expecting flakie polishes, but the welcome was warm upon their arrival. Tollydiggle shown over Au Champagne (ORLY). The flakies in this polish are amazing. They're dark, so they stick out, even when there isn't amazing light coming from the sun. Yet, they've got a rainbow of color that comes out when the light does hit them. This awesome effect is achieved, but the pieces are not muddy looking. I'm stunned. Another surprising bottle that really impressed me, perhaps more than everything else in the sample set I got, is Oil of Veins. Oil of Veins shown over First Mate (China Glaze). A surprising, molten mix of red metallic material, mixed with black glitter. I say material because I don't know if glitter is the right word to describe the consistency of the copper pieces. These pieces run thin in width, but thick and strong in awesome. Just look at the way it changes the look of a dark-blue creme. It looks just like...oil. Equally as exciting to me, but less surprising for readers of Nailed It, are the next polishes: the itty-bitty glitter polishes. I'd like to preface these polishes by saying they are all wonderful, and shown in one to two coats. 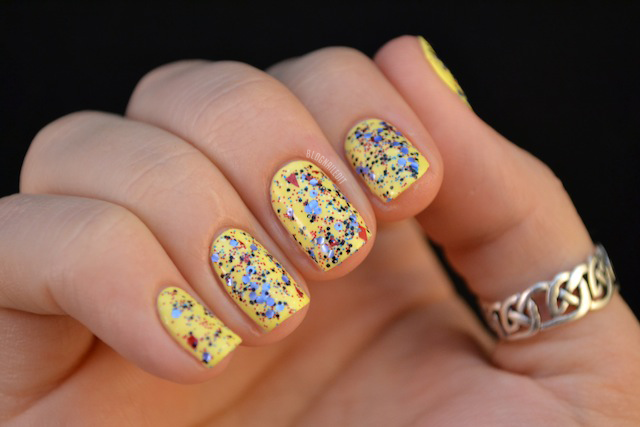 The base is not as smoothly applied as a normal polish, and may benefit from a little thinner formula. With that being said however, these polishes are fun to add to the collection. 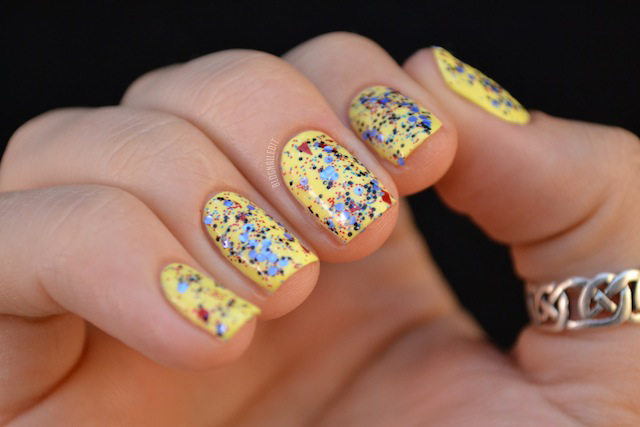 A colorful mix of glitters can really bring out a polish's color, and you can see in the swatches below how the Oz collection from the Etsy shop is doing that. The Horners shown over Electric Pineapple (China Glaze). Mostly matte itty-bitties, with a much smaller amount of metallic glitter pieces, this one was at the top of my list to review. After reading the first sentence of the description of the characters the polish was named after though, I'm more hesitant about The Horners. 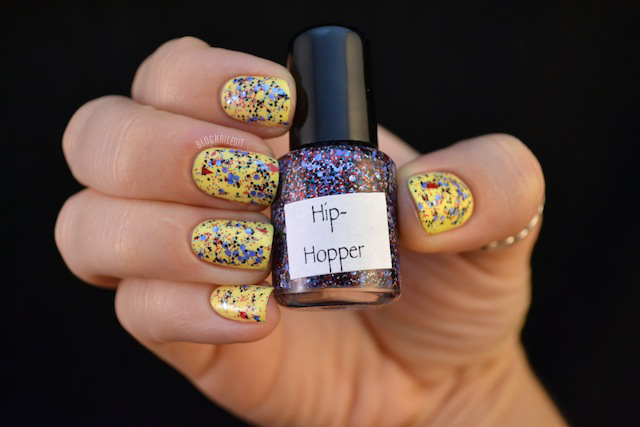 Hiphopper shown over Lemon Fizz (China Glaze). Hoppers each have only one leg, set below the middle of the round, fat body. They hop whenever they move, and even the children stand firmly on their single legs and never lose their balance. Hip Hopper is the champion wrestler of the Hoppers. Now look at Hip Hopper's ensemble in the link in the sentence before this. The colors should make sense now. 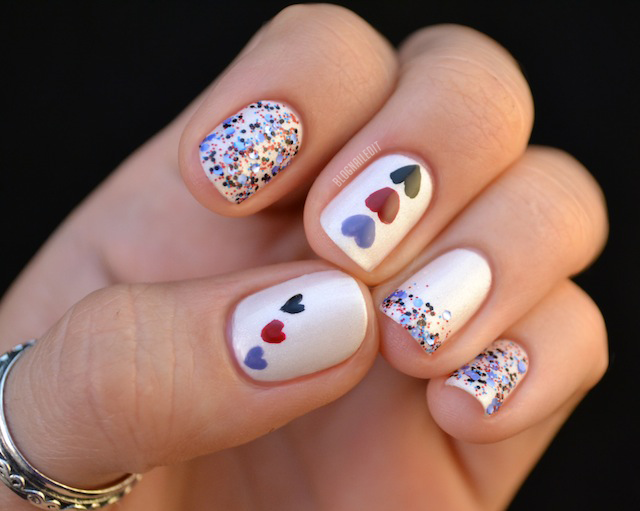 You can also see them in the nail art I did yesterday, using the three main colors. 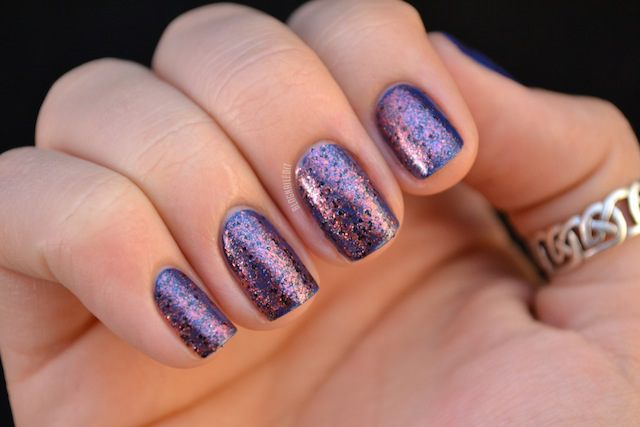 The final matte glitter and polish of this collection is called Regos. I take the greens to represent the the fertile, well-wooded region. Regos shown over Life Preserver (China Glaze). These products were sent to me by A Rhyming Dictionary. The reviews are based entirely on my experience with the products and were in no way influenced by anyone. 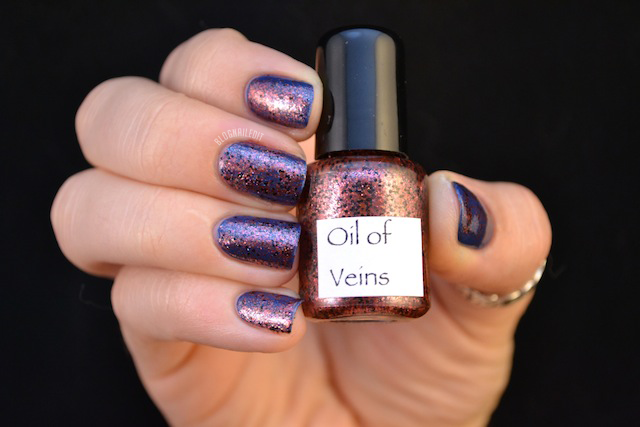 Oil Of Veins - WOW! Ditto GothamPolish; Oil Of Veins is awesome! That, and Tollydiggle, are must-haves. One in my cart already, awaiting a reply on availability of Oil... Thanks for the review!